This iPad Kiosk Stand Includes Key Sets. The Home Button is Covered to Prevent Tampering of Presentations. This iPad Kiosk Stand Comes with a Power Supply! Holds generation 2, 3 and 4 Apple® iPad tablets. 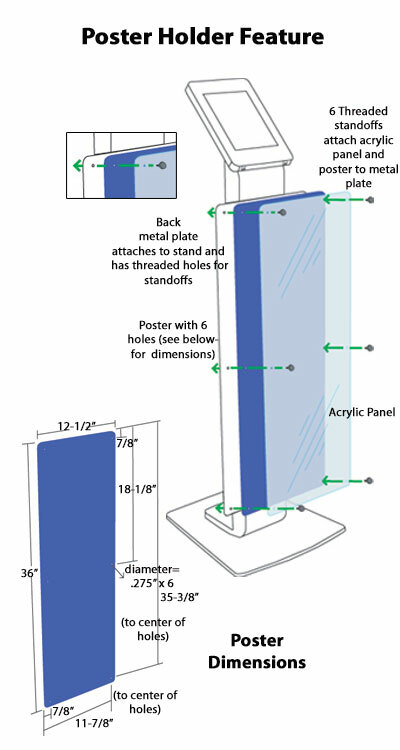 Metal backing with acrylic front poster holder and satin silver standoffs showcases 12-1/2"w x 36"h posters. Sturdy construction to provide stability while interacting with tablet. Displays tablet in landscape or portrait orientation which is ideal for suiting each presentation. Black glossy finish to suit nearly any décor. 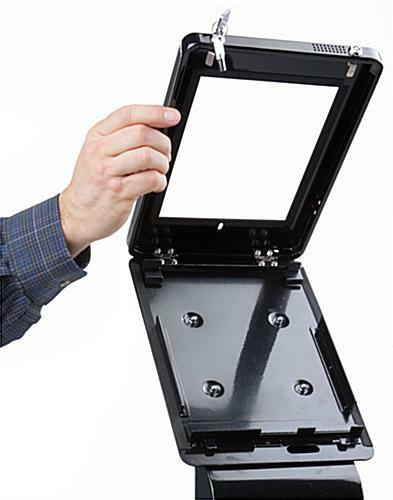 Dual lock mechanism on tablet enclosure as well as a locking rear door for added security. 4 Outlet power bar inlcuded and is mounted inside storage cabinet for hidden charging capability. Access port to the charging plug allows for continuous power supply that is hidden from plain view. 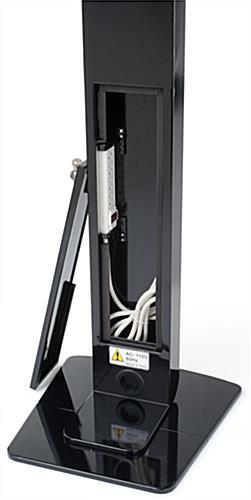 This ipad kiosk stand locks and includes key sets so users control who has access to the tablet. 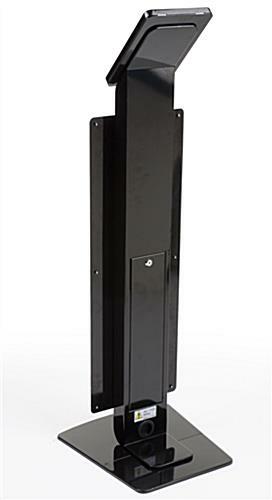 These enclosures are secure making them ideal for use in high traffic areas. 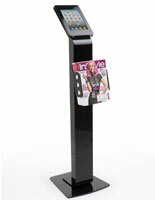 This display, ipad kiosk stand that includes a dual lock mechanism includes keys for the user to control who has access. Interactive advertising using tablets is a growing phenomenon in many businesses. 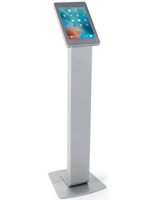 This ipad kiosk stand that has a hidden power bar for charging allows users to hide wires for a sleek appearance. At such a great price, this tablet display with many great features is an outstanding deal! 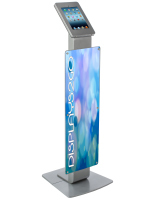 This ipad kiosk stand for public viewing can be used to draw in customers who will then have control over what they view with the interactive presentation. 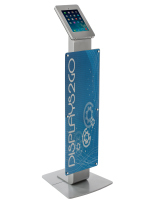 This interactive display will help users boost sales through a modern and 21st century marketing display. 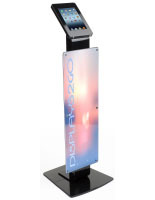 Purchasers can utilize the poster holder on this ipad kiosk stand to show custom printed advertisements that will help draw customer's attention. The return on investment is well worth it with this lasting and durable enclosure. 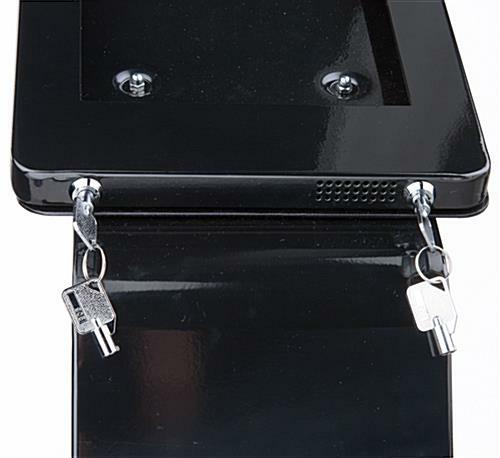 The dual locks on this ipad kiosk stand come with keys so the user can ensure that there is no tampering of presentations. 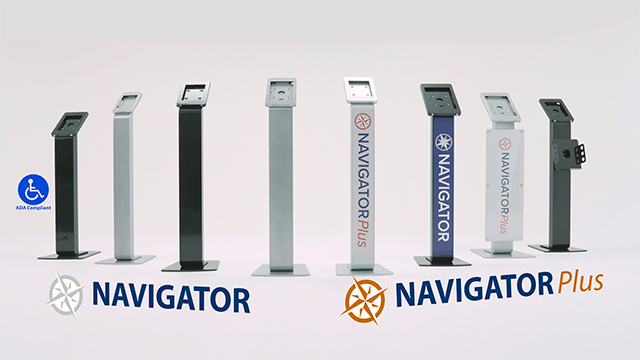 The set height is tall enough for most customers to be able to comfortably interact with the contained tablet. 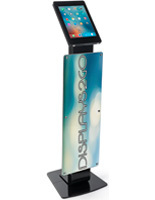 This ipad kiosk stand is great for use at tradeshows or retail stores. While looking for a secure ipad display for public use, look no further! 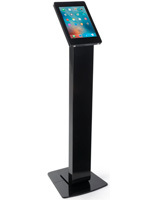 This black finish ipad kiosk stand is sleek to suit many environments including tradeshows, retail stores, libraries, and more! Digital and interactive marketing is more popular than ever and this tablet enclosure will bring any business into the modern era of interactive signage. This comparatively affordable and sleek enclosure makes it a simple to convert from regular marketing to the most up-to-date form. These tablet holders with a black finish suit nearly any décor. This tablet holder is among a large selection of sizes and styles. Businesses will find it simple to choose an enclosure to suit individual needs. The locks on the enclosure itself as well as the rear door will help prevent theft of expensive devices. The home button is covered by the holder to prevent tampering of the presentation by viewers. Please Note: This unit accommodates Apple® 2nd, 3rd and 4th generation iPad design only! Although this unit holds iPads in portrait or landscape layout, the power cord along with the cable channel will be exposed while situated horizontally! Also, the home button access is covered.